Yamaha P45 Review (2017) – Best Keyboard for a Beginner? 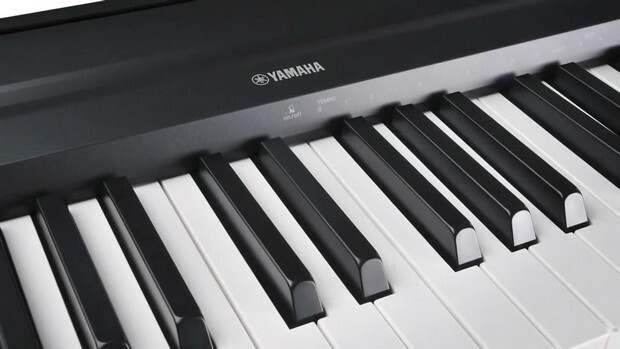 Today, we’ll be reviewing the Yamaha P-45, an entry-level digital piano with a fully weighted keyboard, 10 built-in instrument sounds, and compact design. 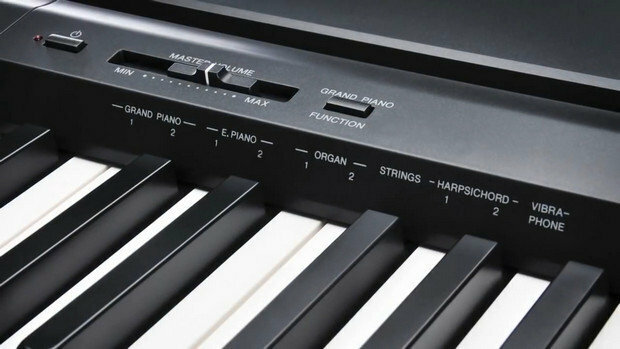 The P-45 and the P (Portable) line in general are Yamaha’s response to hugely popular budget pianos from Casio’s Privia line. 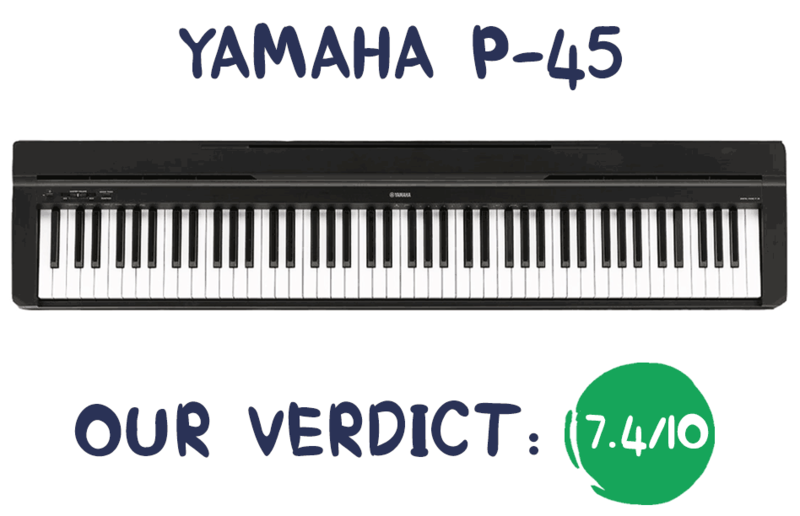 The P-45 is the most affordable digital piano with fully-weighted hammer-action keys in Yamaha’s arsenal. The piano has become very popular among beginners and intermediate players for its simplicity and a very attractive price, not to mention the high quality and realism of Yamaha instruments. The P-45 has replaced the previous P35 and comes with some significant changes, including an increased amount of polyphony, improved piano samples and a USB terminal. Yamaha has also released a special Amazon Exclusive version of the piano, the Yamaha P71, which we’ll talk about further in the review (Summary section). 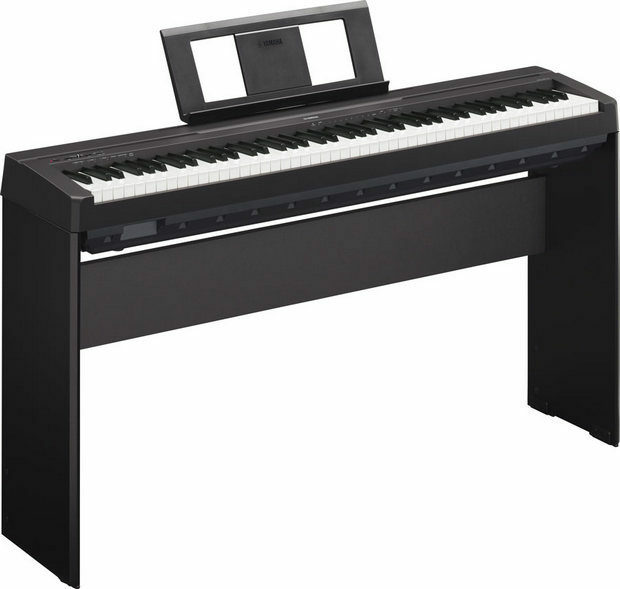 Yamaha P-45 is an 88-key hammer action digital piano with built-in speakers. The piano inherited the compact and lightweight design of its predecessor – P35; they look completely identical. Portability is one of the things I like about the P-45. It will easily fit into smaller spaces and will be a nice addition to your home interior. The piano is 52.2 inches wide, 11.6 inches deep and 6 inches high. The P-45 weighs only 25 lbs and light enough to carry by one person. The piano would be a great choice for on-the-go musicians and anyone who appreciate mobility. 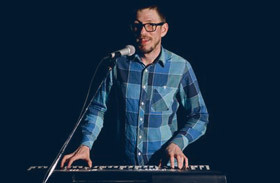 The instrument will fit into most cars, so you can easily take the keyboard to gigs or on the road. Don’t forget though that the P45 is still a full-sized, 88-key instrument and isn’t suitable for long trips by plane/train. Anyway, if you’re going to travel with the piano, I’d recommend buying a padded keyboard bag to protect the piano during long/often transportations. The piano does not come with a stand. The size of the piano allows you to place it on a table or any other flat surface, but you can always buy an optional X-type stand or the L85 furniture stand if you want the keyboard to be stationary. We’ll talk about a stand for the P-45 in the “Accessories” section. Control panel of the P-45 is very simple and straightforward. There are only two buttons and a volume control. The “Power” button turns the instrument on and off; the other button is called “Function” (Grand piano) button, which you can use to either select Grand Piano sound or access all the other sounds and features of the P-45. You’ll need to simultaneously press the “Function” button + one of the piano keys (with a label above) to select the rest of the sounds, adjust touch-sensetivity, metronome tempo, etc. This way of navigating is pretty common for entry-level digital pianos. The P-45 is available in black color only (P-45B). The P-45 features fully weighted 88-key keyboard, called Graded Hammer Standard (GHS). It’s Yamaha’s most affordable hammer action, which you can find in most entry-level digital pianos from Yamaha. The feel and action of the keys of P-45 are very similar to those of an acoustic piano. The keyboard replicates the feel of the hammers inside an acoustic instrument, using actual little hammers inside the keyboard rather than springs (semi-weighted actions). The GHS action has heavier touch in the low end and lighter touch in the high end just like an acoustic piano. The keyboard is touch (velocity) – sensitive, which means the volume/timbre changes depending on how hard or soft you play the keys, reproducing the rich dynamic range of a grand piano. You can adjust the level of touch-sensitivity to better suit your playing style. There are 4 preset settings: Fixed, Soft, Medium (default) and Hard. The “Fixed” setting makes the keyboard not sensitive to the touch, producing the same amount of volume regardless of how hard or soft you play the keys. The “Hard” setting, on the other hand, will provide the widest dynamic range, where you’ll have to strike the keys really hard to produce the loud sound. Unlike some higher-end models, the keys of the P-45 doesn’t have moisture-absorbing keytops that replicate the feel of actual Ebony & Ivory keys and tends to provide a better grip. However, black keys of P-45 have matte finish, which will prevent fingers from slipping off when they become moist. The white keys are glossy but i wouldn’t say it’s a problem, furthermore many acoustic pianos have the same glossy keys. It’s also worth mentioning that Yamaha’s GHS action tends to be a bit less noisy (noticeable when playing at a low volume or in headphones), compared to the Casio’s Tri-sensor hammer action, but in terms of realism, Casio’s action is arguably better. To accurately capture the sound of an acoustic instrument and create high-quality samples Yamaha uses its well-known AWM dynamic sampling technology. The sound you’ll hear on the P45 is a true stereo sound recorded from a full concert grand piano at different dynamic levels. The P45 is not great for musicians who need a variety of instrument sounds and sound effects to create music. The piano has only a basic set of sounds, which would satisfy most piano players. You can make the sound deeper and more expressive by adding reverberation effect. There are 4 reverb types available on the P45: Room, Hall 1, Hall 2, Stage. You can also adjust the depth of the effect from 0 (no effect) to 10 (maximum depth). That’s it as far as sound effects go. The piano tones have been slightly improved over the previous P35 model. But, the most significant improvement is that the polyphony has been doubled from 32 to 64 notes. As a result, the piano will be able to keep in memory twice as many notes, allowing for a fuller and richer sound. While 32-note polyphony may not always be enough for playing complex classical pieces, 64-note polyphony will do in most cases. The P45 features 2 x 12 cm built-in speakers (6W + 6W amp). The sound is loud enough to practice in a relatively small room or to perform in front of a few people, but not more. For a live performance, playing along with several instruments, you’d definitely need an external amplifier as the sound is weak for such occasions. The quality of the sound through the onboard speakers is pretty decent, especially considering the size of the instrument. 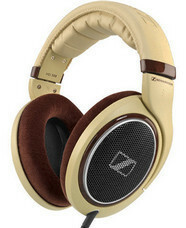 The sound remains clear and doesn’t distort even at max volume. You can get an even better sound by plugging in a good pair of headphones, which will provide a clearer, more detailed sound as well as an immersive listening experience. The piano has a basic set of features that will satisfy most of the beginners and probably intermediate players. Dual Mode will allow you to layer two instrument sounds so that they sound simultaneously across the entire keyboard range. For example, you can layer strings with the piano sound or combine whatever sounds you like to get some new interesting sounds. You can also adjust the volume balance between the sounds to make one instrument sound louder than the other. The mode is often used by piano teachers; sitting next to a student they can play some tunes, and the student can follow along on the other part of the keyboard, playing the same notes. Split Mode, which would allow you to split the keyboard between two different sounds, is not available on the P-45. Like any other digital piano, the P45 doesn’t need to be tuned (ever) and comes tuned at a standard A440 pitch. Fine tuning function allows you to raise or lower the pitch of entire keyboard in 0.2Hz increments to match the pitch of another instrument or singer, for example. The P45 also has transpose function that will allow you to change the pitch of the keyboard in semitone steps. For example, you can shift the pitch and be able to play a song in a different key without changing your hand placements. Transposing also comes in very useful if you want to play a song written in a difficult key with many black keys involved; you can simply shift the pitch of the keyboard and play the song in a different easier key. The P45 doesn’t have a built-in MIDI or audio recorder, which would allow you to record and playback your performances. However, you can still use USB (MIDI) connection and, using certain music software, record your music. A built-in metronome keeps a steady tempo for you by ticking at a consistent speed. Practicing with metronome helps develop such fundamental skills as time keeping and a sense of rhythm. The P-45 enables you to adjust the beat (time-signature), tempo and volume of the metronome. Auto power off function prevents unnecessary power consumption by automatically turning the instrument off after approximately 30 minutes of no operation. The function can be disabled if needed. The piano is equipped with all the necessary ports and jacks to connect the instrument to external devices, such as headphones, external amplifiers, sustain pedals, etc. All the connectors are on the back of the instrument. The big change over the previous P35 model is that instead of Midi In/Out ports the P45 has a USB to Host port, which in most cases is a more convenient option. It allows you to transmit MIDI data to external devices including computers, tablets (adapter is required), etc. To connect the P45 to the computer you’d need to buy an additional A to B USB cable. But don’t worry, they’re pretty cheap. 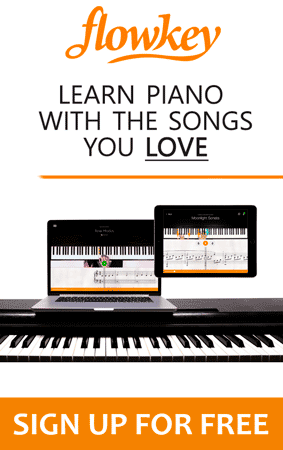 Depending on the program, you’ll be able to learn, compose, record and edit your performances, and do many other fun things that the keyboard alone can’t offer. If you prefer to practice in private or want to get a more detailed and accurate sound, you can always plug in a pair of headphones to the P-45’s 1/4″ setereo jack. The built-in speakers will automatically shut off, and you’ll be able to play any time you want without bothering others. The only thing I find inconvenient is that the headphone jack is on the back of the piano. The jack can also be used as a Line out to connect the piano to external speakers, amplifiers, mixers etc. This is where you’ll need to plug in an included footswitch, which functions the same way as a sustain pedal on an acoustic piano. The jack will also work with third-party sustain footswitches/pedals that have ¼” plug (pretty much all of them have). Predictably, the included Yamaha FC5 sustain footswitch works as it’s supposed to, but is somewhat flimsy and doesn’t look very nice. It’s basically a plastic box-like pedal, which is far from what you’ll find on an acoustic piano. Therefore, buying something more substantial and realistic may not be a bad idea. When it comes to a stand for the P45, there are 3 options for you to consider. The 1st option is not to buy a stand at all. The P45 is compact enough to place it on a desk, table or any other flat surface. For some, it’s maybe not very convenient, but still, that option is available. The 2nd option is to buy a portable X-type stand. The Starter Bundle includes the Yamaha PKBX2 X-type stand, which will work with the P45 just fine. 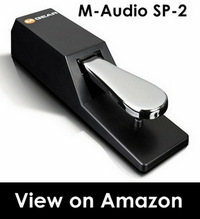 However, there are many other great stands in the different price ranges available on Amazon separately from the piano. 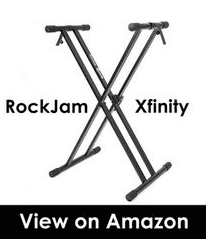 One of my recommendations would also be the RockJam Xfinity Heavy-Duty adjustable stand. The 3rd option is a furniture stand that would be a stationary solution and great for those who don’t plan to move the piano around much and want it to stay in one place. 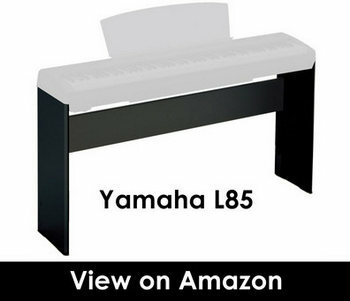 Yamaha offers the L85 wooden stand that fits Yamaha P45/P71/P115 pianos and cost around 100$. The stand is included in the Deluxe bundle but can also be bought separately from the piano. The Yamaha LP5A 3-Pedal Unit compatible with the L85 stand won’t work with the P45 because the piano doesn’t have a special Pedal Unit connector. As I mentioned, it’s possible to take P45 on gigs, rehearsals or trips. It’s very advisable to use some kind of protection for the keyboard to prevent it from damage. For its 88-key pianos, Yamaha offers the YBA881 Artiste Series keyboard bag, which is a great option to consider if you plan to move the keyboard from place to place a lot. Although the P-45 will fit into the Yamaha bag, there will be a lot of space left (in width) as the bag is designed to also fit the YPG-535 keyboard, which is much wider than the P-45 (16.6″ vs 11.5″). So if you want a more suitable (slim) solution, I’d recommend the affordable yet reliable Kaces 15-KB bag, which will fit the P-45 perfectly. 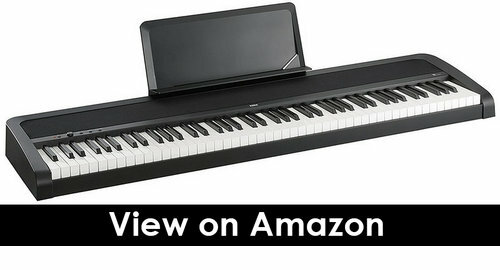 Amazon offers an Exclusive version of the Yamaha P-45 digital piano called the Yamaha P-71. The piano is completely identical to the P-45 but offered at a lower price (50$ difference). So is the P-45 (P-71) worth the money? I’d definitely say it is. For about 400$ you get a great digital piano with realistic piano sound and a full-size hammer action keyboard, which mimics that of an acoustic piano. Portability is another big plus of the P-45. The instrument will easily fit into limited spaces and can be carried by one person. The P-45 is a great option to consider for a college student living in a dorm room who needs a compact piano alternative at an affordable price. Unfortunately, the piano lacks features such as a MIDI recorder, Lesson Mode and Accompaniment function, which would be nice to have. 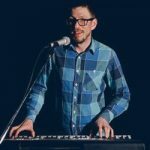 But you’re a beginner on a budget and looking for a simple, no-frills digital piano with fully-weighted keys, reaslitic piano sound, the P-45 is a great keyboard to consider. There aren’t actually many competitors to the P-45 at this price point. But if you’re ready to invest 100-150$ more there are three great alternatives you may want to consider. The P-115 is next model up in the P series. It’s a more advanced keyboard, which comes with a bunch of extra features and upgrades over the P45. Let’s start with the two most important aspects of any digital piano: action and sound. While pianos share the same Graded Hammer Standard (GHS) action, the sound processor is different. At the heart of the P115 is the Pure CF sound engine. It uses samples of Yamaha CFIIIS 9′ Concert Grand and combined with 192-note polyphony (P-45: 64 notes) gives you a solid, natural piano sound. The difference is quite noticeable, and on its own makes it worth paying an extra $150+ for the P115. The P-115 also has more sophisticated and powerful sound system with 4 speakers (14W), compared to the P-45 with only two speakers (12W). Aside from the major sound upgrade, you get a bunch of useful features. Secondly, the P-115 has 50 preset songs that you can practice by playing right- and left-hand part separately. Other features include 10 accompaniment styles, a Split Mode, Line Out jacks and compatibility with Yamaha’s Digital Piano controller app. Lastly, the P-115 has more instrument sounds (14 vs 10) including a Mellow Grand, Vintage E.Piano as well as Wood and Electric Bass. That’s pretty much it when it comes to differences between the P-45 and P-115. Well, if you’re just a beginner and not sure if you’re going to stick with the instrument then paying the extra money may not worth it for you. On the other hand, if you already have some experience and think that you might need the P-115’s extra features and higher quality sound, you’ll probably be better off with the P-115. The PX-160 being about 100$ more expensive than the P45 is a pretty good alternative to the Yamaha, especially if you feel that you need a little more than the P-45’s basic features. The PX-160 offers almost twice as many instrument sounds (18) as the P45(10) and more importantly have 2-track MIDI recorder, which will allow you to record and playback your performances right onboard. The Tri-sensor Scaled Hammer Action keyboard provides Ivory & Ebony touch and is a bit more realistic in my opinion than the P45. The PX-160 also has more powerful speakers (2 x 8 W) compared to the P45 (2 x 6 W), which in practice provide richer and louder sound. An entry-level keyboard from Korg is actually very similar to the P45 in a way that it’s pretty basic and straightforward and without lots of add-ons. The B1 has only 8 instrument sounds (3 pianos) and no recording capabilities. Instead, it offers the fully-weighted Natural Hammer keyboard and powerful 18 W sound system with Motional Feedback technology. The design of the B1 is also very appealing to my taste. However, for the same price the Casio PX-160 offers more features and its Tri-sensor keyboard with Ivory-feel keys feels more authentic than the B1’s keyboard. Is a USB output suitable for using a VST WHILE PLAYING? It is perfectly suitable since it’s a wired connection (as opposed to Bluetooth) there hardly will be any problems connected to sound lags. I have read through your notes and still undersided. I have owned a Korg key board for 10 years which has now lost a lot of key function so looking for a rep[lacement. I have viewed a Yamaha P45 which seems good to me. I play for my own enjoyment, am almost 80 so just need a standard type of keyboard with pedal sustainer. the P115 sounds nice, and how do I purchase this instrument from you, are you in N.Z, or are we dealing with US dollars? What price would be the P15 or P45 with postage costs please. I have a stand. Hi Lucas, I am looking for a piano for my 3 year old daughter who loves music. But I have no idea where to start and what exactly to look for. What do suggest for this age range? Hey Delain, good question, actually! Considering the young age of your daughter, it’s probably a bit premature to invest any serious money into a high-end digital piano. My advice would be to start with something more simple and affordable and then, if your daughter sticks with it, upgrade to a digital piano with fully-weighted keys to ensure she gets a more realistic playing experience similar to a real piano. There are a lot of beginner-friendly keyboards to choose from. While they’re not necessarily the best choice for playing piano, they have a number of advantages over digital pianos including a wide selection of built-in sounds, accompaniment styles, and interactive features, which I think could benefit kids who are only beginning to explore music, sound, rhythm, and are too young to take piano lessons. A keyboard with light-up keys is another good option to consider. A good choice would be Casio LK series. P.S. I will definitely write a more in-depth article on how to choose a keyboard or a digital piano for a child with some product recommendations. Thank you, Lucas! From soup to nuts, I followed through with recommendations on the Yamaha P71 (Amazon) and the various accessories (as covered in your highly detailed, thoughtful review.) For you: Ashish Xiangyi Kumar’s Youtube Beethoven selections will never leave you disappointed. He tends to go with the new breed…that is to say, today’s crop…Jonathan Biss, Paul Lewis, et al.